Meet the driving force behind Chloe Capital’s new website and branding! 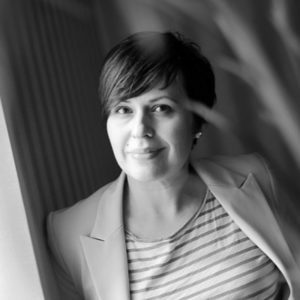 Ewelina Zajac-Holdredge is the founder and creative director of IdeaKraft, a website development, packaging design and digital marketing agency with offices in Binghamton, NY and New Orleans, LA. The Chloe Capital team met Ewelina through our work with nonprofit Upstate Venture Connect, when collaborating to strengthen entrepreneurial activity in the greater Binghamton area. A friendship was born, and soon after Ewelina joined Chloe Capital’s mission to reduce the gender gap in entrepreneurship. Idea Kraft has been a major supporter of Chloe Capital since our Women Investor’s Accelerator, and continues to help advance our movement through the redesign of our website: ChloeCapital.com. Idea Kraft is a WBE, WOSB and EDWOSB Certified Woman Owned Business that works with a variety of clients, from early-stage startups, to global Fortune 500 companies. In addition, Idea Kraft is changing communities one branding at a time through Re-Kraft, a bi-annual event where the Idea Kraft team volunteers their time to rebrand a startup, non-profit or small business in New Orleans or Binghamton within 48 hours. Idea Kraft also hosts meetups for creative entrepreneurs, and recently launched Baseline Type, a resource for anyone looking to easily improve the typography on their website. We applaud Ewelina’s unique vision and entrepreneurial spirit. Her award-winning design work has been recognized by many influential design organizations and media publications. How lucky are we to have such talent in our corner. Thank you Idea Kraft! We’re feeling the love, friends! Since Chloe Capital announced our plan to travel around the country in search of the most promising women-led innovation companies, requests from community leaders interested in us stopping in their city has been tremendous. We’re currently in the planning stages with leaders in Binghamton, Boston, Chicago, Denver, and Rochester, with conversations moving forward with Austin and San Francisco. Thank you to everyone who has reached out. We welcome your partnership and look forward to making the Chloe Capital Tour a true milestone in our mission to reduce the gender gap in entrepreneurship and venture capital.